See Science is committed to supporting STEM (Science, Technology, Engineering and Mathematics) delivery across the whole of Wales to all schools, FE colleges HE Institutions and community groups. We offer a range of products and services that support the teaching and learning of STEM subjects in Wales within a real world context. See Science offer a variety of bilingual STEM workshops and CPD for schools and businesses which can be tailored to suit your individual needs – read more here. Find out about the current projects See Science has initiated or is involved with here – and our previous projects here. See Science coordinate the STEM Ambassador Hub in Wales to help inspire young people about STEM. We keep schools in Wales informed about high-quality activities that they can access to enrich and enhance the STEM curriculum and enable them to use a range of STEM Ambassadors, so that teachers can incorporate into their teaching exemplary links to the world of work. Participating in the STEM Ambassador programme is easier than ever via the STEM Ambassador website, designed to put you in control of your STEM Ambassador experience. How do I use the website to engage with STEM Ambassadors? You can register and request a STEM Ambassador through the website whenever you want and wherever you are. Registering and requesting a STEM Ambassador via the website is quick and easy. You can access the website on your smartphone, tablet or PC whenever it's convenient. CREST is Britain’s largest national award scheme for project work in the STEM subjects - Science, Technology, Engineering and Maths. CREST brings science to life by offering young people aged 11-19 opportunities to explore real world projects in an exciting and innovative way. See Science is the Regional CREST Support Organisation (RCSO) Wales. We provide expert guidance throughout the CREST Awards scheme. Read more about See Science and CREST here. Follow these links for comprehensive lists of up-to-date resources, activities and external providers offering STEM-related activities or services. "The project has definitely strengthened transition links, made us consider teaching skills in different ways and equipped pupils with a stronger drive to pursue a career in science in the future. Many thanks all!! Please feel free to pilot any schemes on our family of schools in the future." Read more feedback and testimonials about See Science's services and projects here. CREST Awards FREE in Wales for another year! We are thrilled to share the news that the Welsh Government have confirmed that they will fund all Discovery, Bronze, Silver and Gold CREST Awards in Wales until at least March 31st 2020, as they have done for the past few years. CREST is a nationally recognised scheme for student-led project work in the STEM subjects that inspires young people to think and behave like scientists and engineers. CREST provides activities and project ideas for a range of ages, group size and abilities. From off-the-shelf, one-hour long challenges through to large-scale, student-led projects of over 70 hours work or more, CREST can be done by anyone. The CREST Awards funded by the Welsh Government are aimed at young people aged between 10 and 19 years. They can be done in schools - as part of lessons or as STEM Club activities - in youth groups or by individuals. There are downloadable projects or design your own. Details at https://www.crestawards.org/ or contact Llinos at llinos.misra@see-science.co.uk with your questions. See Science will be offering Community Groups such as Brownies, Guides, Scouts, Urdd, and Youth Clubs the opportunity to take part in a free Chemistry workshop between 1 March and 30 June. The workshop will offer a carousel of 4 different activities which will focus on the Chemistry of the High Street and will also provide an opportunity for leaders to encourage young people to participate in a CREST Award if they wish. All materials will be provided free of charge. Please share news and events with us! A call for Scientists and Engineers - Engage school students from your desk! 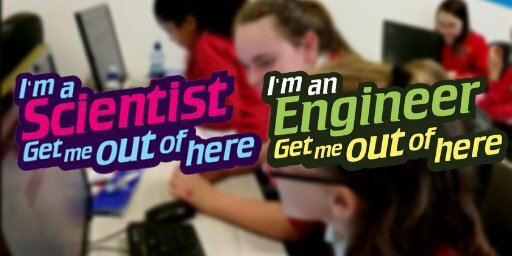 I’m a Scientist and I’m an Engineer are online STEM engagement competitions that get people in science and engineering talking with curious school students across the UK. Taking part is an enjoyable, easy way to get involved in STEM engagement. You'll develop communication skills and gain a fresh perspective on your work while answering students’ questions and showing that STEM roles can be for them. In the next event between 10-21 June there’s Particles Zone, Plants Zone, Space Zone, Mental Health Zone, and General Zones for scientists, while engineers can sign up for the Health Zone and the General Engineering Zone. Find out more here and apply by Monday 23rd April. >> Read the full versions here.